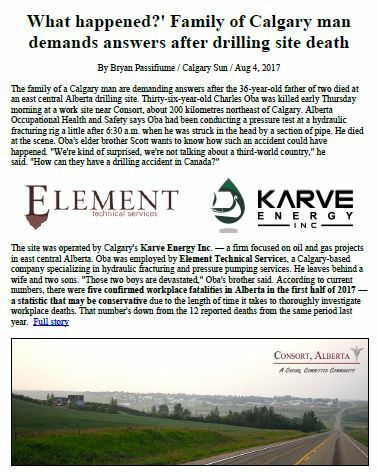 Fracking by Karve Energy Inc. at Consort Alberta killed Charles Oba, Calgary father of two; Family demands answers. Police not releasing name of the victim. Will Karve Energy blame Charles? Family members are demanding answers after a 36-year-old father of two died at a central Alberta drilling site. Charles Oba was killed early Thursday morning at a work site near Consort when he was struck in the head by a section of pipe while conducting a pressure test on a hydraulic fracturing rig, said a release from Alberta Occupational Health and Safety. Speaking to Postmedia Friday, Oba’s elder brother Scott wants to know how such an accident could have happened. Oba said he and his brother have seen their share of industrial accidents in their home country of Nigeria due to poor safety standards. “We’ve seen drilling accidents where there are no safety checks — we want answers,” said Scott Oba. The site, about 200 km northeast of Calgary, is operated by Calgary’s Karve Energy Inc.
Oba was employed by Element Technical Services, a Calgary-based company specializing in hydraulic fracturing and pressure pumping services. Oba said his brother had been employed by Element for about a year, and had lived in Calgary for the past five years after moving to the city from Nova Scotia. “Those two boys are devastated,” Oba’s brother said. While Oba was informed of his brother’s death on Thursday by his employer, he said the tragedy won’t seem real until the family sees his brother’s body, which is currently being held for an autopsy by the medical examiner. In the end, Oba hopes some good can come from the tragedy. “It’s not just for us, it’s for the next person,” he said. Calls to Oba’s employer weren’t returned. The accident is being investigated by provincial occupational health and safety inspectors. Tremendously sorry to hear this. There are inherent risks in oil field equipment and operations, and the consequences of an accident can be catastrophic. Hopefully this was a crew that practised safety to the highest standard; speaking from experience it’s difficult to get everybody on board with safe procedures, and especially important for individuals to treat every situation as a potential hazard. Mr. Oba’s family deserves any answer they need and I am sure they will get them. I know this is a sensitive thing but please try to understand what you’re talking about. Fracking and drilling are two very different things and the way this article is written only makes the story more confusing. Also, there is no fracking rig. Hydraulic fracturing is the injection of water and sand into the earth under extremely high pressures (up to 15,000 psi or 100 mPa). The risk of treating iron failure is ubiquitous. Condolences to the Oba family. Thank you for taking your concerns public and hoping that this time, the industry is decent enough to provide you the answers you seek and deserve. This is a sensitive issue and facts are important. Drilling and fracking are two distinct processes, both of which are necessary for the production of unconventional resources in the province. Nearly every new well in the province will have to be fractured to produce. Fracking is not just injecting water and sand. Some completions, use no water at all and are fractured with hydrocarbons (kerosene, diesel fuel or other petroleum derivatives), with gelled propane, or even nitrogen. Slick water or gel water fracs, do contain water, proppants-sand which is acutally carcinogenic crystalline silica or ceramic beads and a myriad of chemical additives such as energizers, biocides, friction reducers, surfactants, corrosion inhibitors and breakers. Treating iron failure is not ambiguous, it is necessary for repsonsible operations, and mandatory on drillling and servicing rigs. Rigs have 250, 500, 750 and 1000 (level 4) inspections, which include x-rays on derricks, iron roughnecks and component welds. Good rig managers and hands will be, minute by minute watching lines, fittings and all iron for cracks, leaks or stress fractures and repairing as needed. Preventing iron failure and pressure anonmolies, is essential to keep workers safe and alive. Again, most heartfelt sympathy to this family. Occupational health and safety officials are investigating after the death of a worker at a drill site on Thursday. The victim, described by RCMP as a 35-year-old Calgary man, was killed a little after 7 a.m. at a work site northwest of Consort, Alta. Mounties say the death occurred during a pressure test at the drilling site. Provincial occupational health inspectors have taken over the investigation, and police are not releasing the identity of the victim. The family of a Calgary man are demanding answers after the 36-year-old father of two died at an east central Alberta drilling site. Thirty-six-year-old Charles Oba was killed early Thursday morning at a work site near Consort, about 200 kilometres northeast of Calgary. Alberta Occupational Health and Safety says Oba had been conducting a pressure test at a hydraulic fracturing rig a little after 6:30 a.m. when he was struck in the head by a section of pipe. “We’re kind of surprised, we’re not talking about a third-world country,” he said. Oba said he and his brother have seen their share of industrial accidents in their home country of Nigeria — a nation that lacks stringent occupational safety standards. The site was operated by Calgary’s Karve Energy Inc. — a firm focused on oil and gas projects in east central Alberta. Inquiries for comment to Oba’s employer weren’t returned by press time, and the cause of the accident is still under investigation by provincial Occupational Health and Safety inspectors. According to current numbers, there were five confirmed workplace fatalities in Alberta in the first half of 2017 — a statistic that may be conservative due to the length of time it takes to thoroughly investigate workplace deaths. That number’s down from the 12 reported deaths from the same period last year. As the family comes to grips with their tragic loss, they’re struggling to understand how such an accident could have happened. “Where was he supposed to be? Where was he? Was there safety checks that were missed? What happened? We need specifics,” he said. While Oba was informed of his brother’s death on Thursday by his employer, he said the tragedy won’t become real until the family’s had an opportunity to see his brother’s body — currently on hold until an autopsy has been performed by the medical examiner. “In a way, you kind of want to see and verify that this is your brother,” he said. In the end, Oba hopes some good can come from the tragedy of his brother’s death. “Whatever specific job he was doing, they’re going to put somebody else in there. Are oil and gas industry work sites becoming more dangerous? 2016 04 26: Is Anadarko leaking explosive methane into homes in Colorado? Company to shut down 3,000 oil wells after fatal home explosion April 17, 2017 in Firestone, Weld County that killed two, injured two. 2014 07 07: Business Insurance: Oil boom and fracking cause spike in energy industry workplace deaths. Do you have copies of Commercial Liability Insurance Coverage for companies operating near your home and loved ones? 2017 06 01: New study on diesel pollution: “There is strong evidence that particulate matter (PM) emitted mainly from diesel road vehicles is associated with increased risk of heart attack, heart failure, and death.” Ever wonder why so many get sick when the oil & gas industry invades your home & community? Air pollution cost Canadians $36 Billion in 2015 alone! 2015 06 02: Toxic oil and gas industry vapors suspected in deaths of three Colorado oil and gas workers; Why blame nature or the victims? 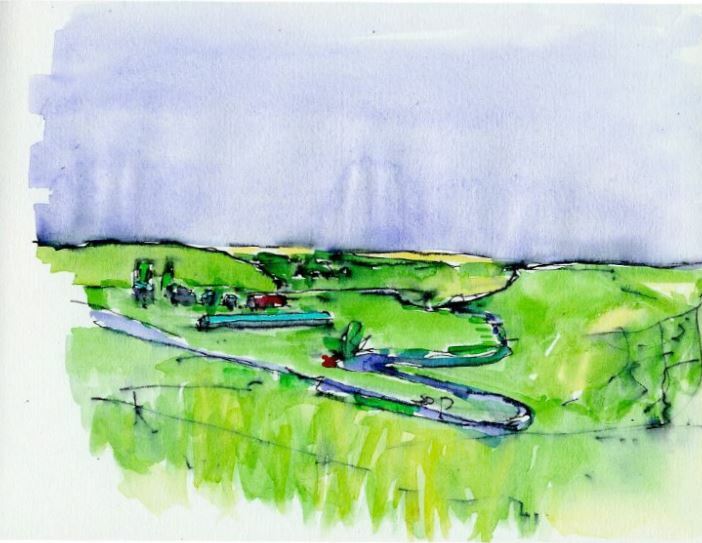 2015 08 09: If industry’s abandoned bitumen sites kill wildlife, what’s it doing to groundwater and humans? There’s no crime quite like murder. Though obviously personal, in that an individual has been killed, it also has a uniquely public aspect: One of our own has been taken, and there exists a genuine collective loss. Who was the victim? What might he have become? What might she have done with her life had she been allowed to keep it? But in Alberta this week, they took a significant step to changing all that. The driving force behind the change in Edmonton is unclear — it just abruptly changed in mid-January — but certainly, when the Alberta Association of Chiefs of Police met this week to adopt the “decision framework on naming homicide victims,” the mandate was clear — and clear, too, was the fact the tedious document wasn’t written by cops. The AACP president, Medicine Hat Police Chief Andy McGrogan, said Thursday in a phone interview that the minister was simply asking that the various forces be consistent. And the Freedom of Information and Protection of Privacy Act (FOIP) referred to throughout the document makes it plain this is the Alberta version. In any case, Alberta’s police have now cheerfully agreed to a complicated seven-part consideration process that will have them (and lawyers and privacy officers) weigh whether it’s in the “public good” to release the name (that being such factors as the transparency of the force, increased public confidence, allowing community members to pay their respects, etc., etc. ), whether the family of the victim wants the name released, and whether and how much other information is already in the public domain, etc., etc. Waging a lonely battle against the new policy — simply by reporting upon it — has been veteran CBC courts and crime reporter Janice Johnston, who has pointed out some of the absurdities: That, for instance, the Alberta RCMP, which years earlier had stopped naming murder victims, was now naming them again just as Edmonton was refusing; that when a teenager named Brandon Provencher was murdered at an LRT station, the force refused to name him even as he was quickly identified through social media posts and a fundraising page; and when an 11-day baby died of a methamphetamine overdose and her mother was arrested and charged with second-degree murder, the mother was identified but not the baby. The name of the baby was learned, and published, when just days later court documents identified her as Eliana. But that raises another issue: What happens when these cases come to trial, the accused killers in court? Will another arm of the state, prosecutors, feel empowered or obliged to seek publication bans on the names of those who have been killed? FOI and privacy legislation has been in existence for decades, though it feels much longer — federally since 1990, in Alberta since 2000. Nothing huge appears to have changed in the intervening years. These are maddening acts to read, and I’ve read them, but can find nothing that specifically refers to homicide investigations or the disclosure of victims’ names. Rather, the Alberta chiefs appear to have adopted legal interpretations of what are very broad laws that should be used to protect citizens’ privacy in the ordinary course. Murder is the antithesis of all that, exceptional, a crime against the public order, the public good, the body public: It isn’t prurient to want to know who’s been killed. It’s smart, and in a democracy that took openness seriously, it would be routine.